"The transformation that happens in the shadows and in the steaming, that to me is where the beauty lies. Where the garden begins." "The Dimples His Mother Loved"
"He stood rigid like the kitchen chairs and tried to figure out what his aunt was hiding underneath her dress. From the shape of the bulges, he guessed that she was probably storing pork. At least that would explain the smell." 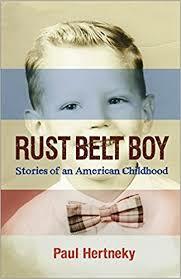 "RUST BELT BOY: STORIES OF AN AMERICAN CHILDHOOD," BY PAUL HERTNEKY"
"Rust Belt Boy offers an honest glimpse through the windows of mid-century Pittsburgh duplexes; from immigration, corruption, complacency, and resiliency, Hertneky lays the scaffolding of the city’s past and leaves readers feeling optimistic about the next wave of innovation." Mud and kindling fronds of grass above mosaic tiles. This is where we stay. Where we cling to with curled fingers. Don't ever make us leave. We lie in hammocks colored with streaks of sunset and hope that we will melt. We trust the ropes as dry leaves fall through branches overhead. There is a panicked beating and we tell ourselves the guanaco run. Ignore the swelling in our chests. We uncork, unwind, undo. We sleep and the rooster crows. Bend at the waist like dogs. Inhale, let it drop, let it sag and fill. Exhale, purring into the autumn desert, into dreams of moon over dusted rock.